What's a Poingo? 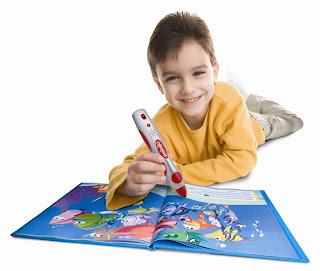 Well it's a story reading wand. Sound familiar? Instead of doing a Poingo vs. Other wand, I'll tell you about the Poingo. 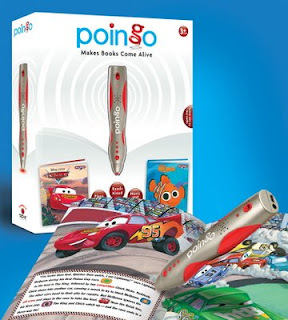 The Poingo is a reading wand that is quite light and it comes pre-loaded with stories. No downloading necessary out of the box. This could come in quite handy when your budding bookworm wants to play with it NOW and not later after Mama pulls out her laptop. When your child points to the word box, the Poingo reads to them. The entire story box. The neat thing is that a few words in each box are highlighted and if you point directly on those words, you get read a definition. Nifty! Especially nice for those of us with kids who ask, "What does that mean?" It doesn't read word to word thou, so that's a flaw - That's a minus point on the "interactive" scale. But it does have two volume settings! The wand also had a headphone jack. Poingo does have Disney stories...plus for some, minus for other people. Overall, it was good. My daughter really enjoyed the quizzes that are included more than the reading. I think she's peaking on this "a toy is reading to me" wave, which is kinda sad because I swear I was still using my Mickey Mouse 45's until at least 2nd grade because I loved hearing Tinker Bell's wand. The Poingo should be only $35 and that's with two books, so if you want a more economical gift for your lil one, this might be it. But I would definately look thru the book selection before purchasing. The hard part might be if you get a Poingo and your kid's friend has the other wand. They don't interact. Kinda like XBox & wii. But maybe it'll be a good chance to learn to share and not try to figure out which one is better than the other.